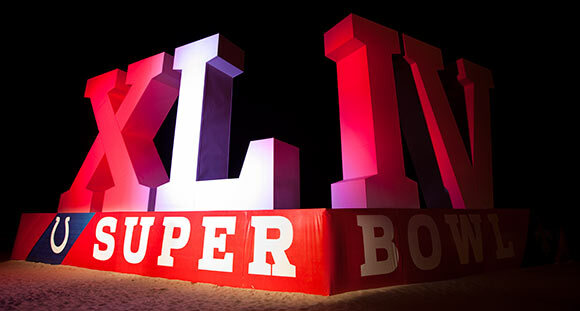 In just one short hour Super Bowl XLIV will officially commence. While NFL football is not my favorite past time, it is hard to disregard the enormity of the game. For Vlad and I, the weeks and months leading up to the Super Bowl has been following us around. This year’s game is being held at the Miami Dolphins Stadium, a mere 25 minute drive from our house. With Fort Lauderdale as the official host, we have been able to see the excitement over the Super Bowl just minutes from our house. One of our favorite displays is the large XLIV sign in the heart of Fort Lauderdale beach right off of the famous A1A strip (photograph by Vlad pictured above). Tonight the New Orleans Saints are taking on the Indianapolis Colts in a game that is sure to have a great match up along with hilarious commercials. We have already asked you all if you coordinate your bag to your team colors when it comes to college football, what about NFL football? What colors are your outfit consisting of and who are you rooting for tonight?